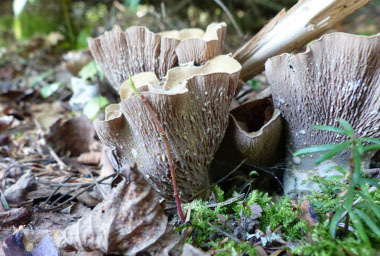 Overview: Pig's ear fungi has a mycorrhizal relationship with mainly coniferous trees such as fir and spruce but also with some deciduous trees such as beech trees. The hyphae of the fungus are closely associated with the roots of the tree and both species gain from this relationship. Gomphus clavatus is in the Cantharellaceae family. 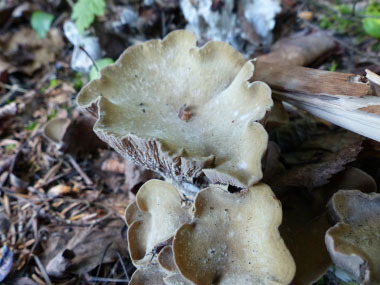 Extracts prepared from Gomphus clavatus fruit bodies have a high antioxidant activity, and a high concentration of phenolic and flavonoid compounds. Phenolic compounds identified from the fungus include protocatechuic acid, gallic acid, gentisic acid, vanillic acid, syringic acid, cinnamic acid, caffeic acid, ferulic acid, and tannic acid. 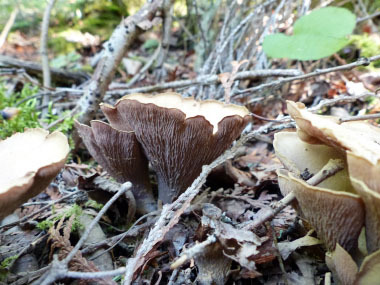 Distinguishing Features: Pig's ear fungus derives its name from the funnel-shaped and folded fruiting body, which resembles a pig's ear in shape and texture. The cap is depressed and has a wavy margin; it is violet, fading to yellowish-brown over time. It can be somewhat olive-coloured with age. The stipe (stem) is short and thick and completely solid. The flesh inside the cap and stipe is white. 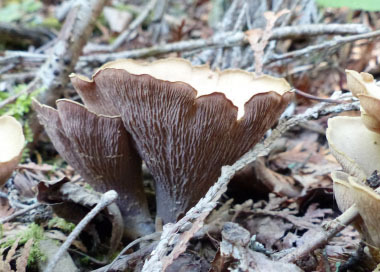 The underside of this mushroom does not have true gills, it has ridges that run down the stalk almost entirely to the base. 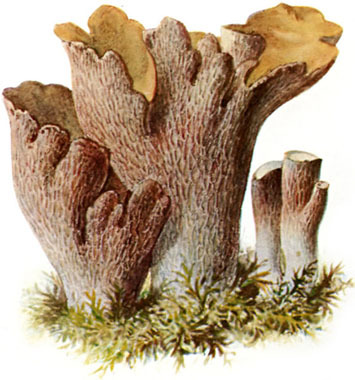 Height: This mushroom grows up to 15cm (6”) tall. They measure 5 to 10cm (2 to 4”) across at the top. Habitat: Pig's ears grow in coniferous forests (especially among spruces and firs). They grow from the mossy ground or on rotten wood. They are usually found in large clusters, arcs, or rings and can yield very high quantities. 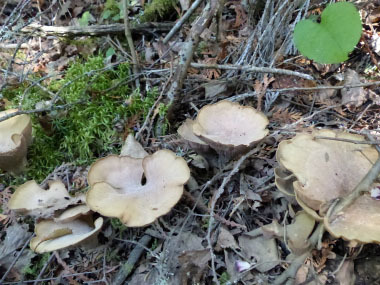 They are more common at elevations of greater than 600 metres (2,000') in moist, shady areas with plenty of leaf litter. Spore print: Spore print is ochre (brownish). 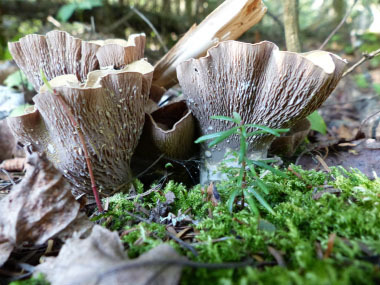 Season: The lobed fruiting bodies appear between August and November. Gills: Gills are decurrent, poorly developed consisting of shallow wrinkles. They are pale purply-brown. Edibility: Pig's ears are truly exceptional mushrooms. They have a very firm and meaty texture, which holds up well in soups, sauces, and baked dishes. They have a great musty and earthy aroma and taste really nice. 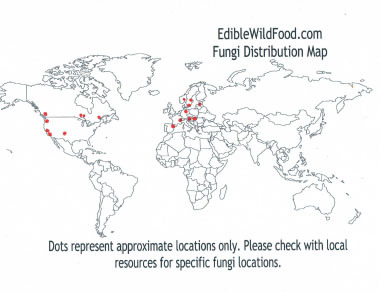 As all wild fungi, they must be cooked.